This site is dedicated to William B. "Bat" Masterson,his life, history and my portrayal of him. 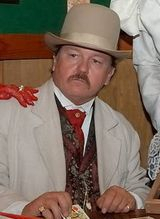 Welcome to Jerry's web page tribute to William Bartholomiew (Barclay) Masterson. I have been doing research and portraying Bat since 1996. At this time I would like to personally thank Robert K. DeArment for assisting me in making Bat come back to life. Also, to Dr. Lafitte for his grueling mentor ship of me to make Bat believable. My family has told me I am related to Bat, on my mother's side. My grandmother was born, in 1893, and raised for a short time in Weed, NM; on the Masterson ranch. Unfortunately, recent genealogy research, it appears I am not related to Bat. I hope you enjoy yourself while here and leave me a word or two that you stopped by.